They could not have put this together without the help of all 3 rohhad charities, ROHHAD Fight Inc, ROHHAD Association Belgium and our own ROHHAD Association. 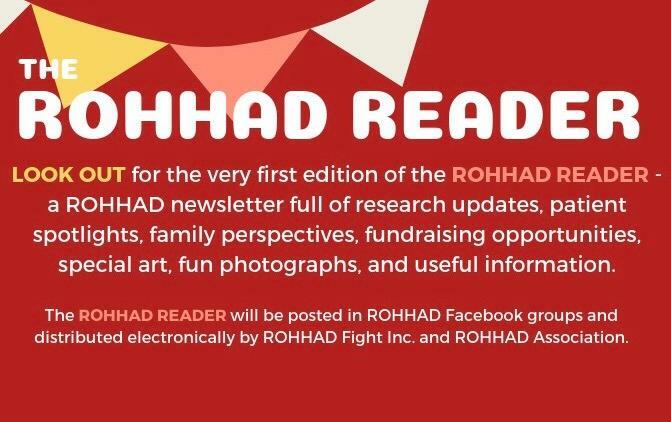 However it is our awesome families who shared their photographs and experience with ROHHAD that has made this issue very special and an incredible read so an extra special thank you to all of you who got involved. We hope you enjoy it as much as we have here at the charity. One last Huge thanks to all of the doctors, junior doctors and scientists that are involved in ROHHAD Research already and whom are keen to carry on researching and help us to understand this disease better hopefully one day leading to a cure. The ROHHAD Reader introduces you to the teams who are doing research currently and who will be doing more as time goes on. As you will see we have doctors in various places across the world who are working hard to try and help our children. As a charity and as families affected hopefully we can all continue to work hard together to raise funds and awareness of ROHHAD so that we can help fund this vital research. If you would like to help please visit our donation page or get in touch to find out more about support you can give.